Ephrata Cloister. An extraordinary restoration of the 18th-century cloister grounds and structures of the German Seventh Day Baptists, a religious communal society. A National Historic Landmark, the Cloister contains 12 buildings, medieval in design, that depict the austere lifestyle and impressive architecture, printing, calligraphy and music of this sect. The Visitors’ Center has a slide show and guided tours. Rts. 272 & 322. EphrataCloister.org. Springton Manor Farm. 19th-century manor house was the country estate of a prominent Philadelphia family. Now a demonstration farm where children meet animals in a petting area and learn about farming. Park open year-round. 860 Springton Rd. ChesCo.org/CCParks. Sesame Place. Sesame Street-themed park for families and kids with 50 activities, live shows with Big Bird and friends, and a musical parade. 100 Sesame Rd., Rt. 1 to Oxford Valley Exit. SesamePlace.com. Colonial Pennsylvania Plantation. Recreation of a 112-acre working 18th-century farm, with farmers and guides in period garb, Belgian horses, Red Devon milking cows, Dominique chickens and two very large pigs. Weekends, 3900 N. Sandy Flash Dr., Newtown Square. ColonialPlantation.org. Herr Foods, Inc. USA Today’s 2016 Readers’ Choice #1 Best Factory Tour—beating Hershey’s Chocolate World, at #4! Factory tours show the real operation, with real workers, and include secrets like how tortilla chips get their flavor. Tours end at the Snack Bar and Gift Shop. Reservations required. To schedule: 800-284-7488; or reserve tickets online: Herrs.com. The Village of Oxford celebrates its 250-plus-year history in a charming historic district. Drive the Covered Bridge Tour through four quaint bridges, or try the Historic Walking Tours to enjoy shopping and refreshments in town. For tours, coupons, guides and more, visit DowntownOxfordPA.org. St. Peter’s Village and Hopewell Furnace National Historic Site. Once a thriving country village, now home to an inn, restaurant and artisans whose shops line the road. A major attraction is French Creek, with mammoth granite boulders, providing delightful picnic spots. Off Rt. 23, St. Peters Rd., St. Peters. After lunch, head for Hopewell Furnace National Historic Site, restored 1700 iron-making village. 2 Mark Bird La., Elverson. NPS.Gov/HoFu. Washington Crossing Historic Park. Where George Washington and the Continental Army crossed the Delaware River on Christmas 1776 to surprise the Hessians camped at Trenton. The park includes the 19th-C. village of Taylorsville, the outstanding Bowman’s Hill Wildflower Preserve, and recreation and picnic areas, on a beautiful section of the Delaware River. 1112 River Rd. WashingtonCrossingPark.org. TreeHouse World. A place to explore the newest and coolest treehouses around, to challenge yourself with their unique high adventure programs and a place to have a ton of fun. 1442 Phoenixville Pk. TreeHouseWorld.com. West Chester Railroad. Reminiscent of the “lazy, hazy, crazy days …” you can take a relaxing 90-minute ride through the scenic countryside between West Chester and Glen Mills. The Summer Picnic Specials run every Sunday through Sept. 17, with lunches available for purchase. Can be chartered for special events and catering is available. Market St. Station, WestChesterRR.net. Historic Houses of Odessa. An outstanding collection of period household furnishings, fine and decorative arts. Five distinctive properties are unique examples of the architectural heritage of Colonial Delaware and tell of Odessa’s role in the Underground Railroad and as a Colonial grain shipping port. HistoricOdessa.org. The town of New Castle, established in 1651 and where William Penn landed in 1682, is a beautifully preserved Colonial town center situated on the Delaware River. There’s a park along the river, historic restaurants and B&Bs, as well as interesting shops. Visit Immanuel Church and its churchyard (dating back to 1703), and the George Read II House, a grand Federal mansion surrounded by a handsome garden. NewCastleCity.Delaware.gov. Delaware River Tubing & Jet Boat Tours. 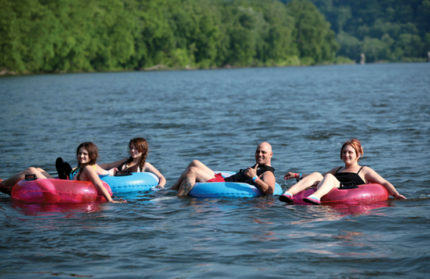 Enjoy a beautiful day floating down the Delaware River on a 3-4 hour river adventure in a tube, raft, canoe or kayak. Every rental includes a free BBQ meal and everything needed to experience a fun day on the river is all included. Delaware River Tubing is proud to have won the 2017 NJ Governor’s Tourism Award and offers some of the best river tubing, rafting, canoeing and kayaking trips in the world. 908-996-5386; DelawareRiverTubing.com. Enjoy the inviting open space that’s part of County Lines country. John James Audubon Center at Mill Grove. The fieldstone mansion, now a museum, displays Audubon’s major published works plus original prints and memorabilia. The 175 acres are a wildlife sanctuary with 175 species of birds and 400 species of plants. 1201 Pawlings Rd. JohnJames.Audubon.org. Morris Arboretum. The official arboretum of PA. On its 92 public acres, thousands of rare plants (many of Philadelphia’s oldest, rarest, largest trees) are set in a Victorian garden. Award-winning rose garden; English landscape park; loggia and hidden grotto; Japanese gardens; swan pond. Special events. 100 E. Northwestern Ave. MorrisArboretum.org. Jenkins Arboretum. A 46-acre arboretum that emphasizes azaleas, rhododendrons and plants of local woodlands, including ferns, groundcovers and colorful wildflowers that bloom over a long season. 631 Berwyn Baptist Rd. JenkinsArboretum.org. Willistown’s Okehocking Preserve & Okehocking Nature Center. 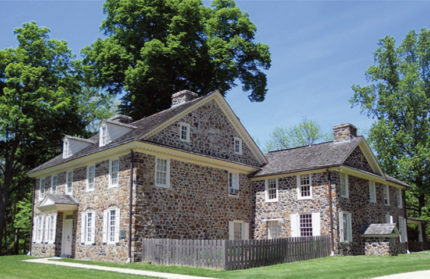 180 acres of the 500-acre Okehocking Land Grant Historic District, are likely the only known grant to an Indian tribe authorized by William Penn, conveyed in 1703. Includes meadowlands, upland hillsides and old-growth woodlands, with 5 miles of hiking and horse riding trails. The Okehocking Nature Center. Providing environmental education and recreational activities including workshops on sustainable gardening, demonstration gardening and energy conservation. In the historic Garrett Farmhouse, 5316 West Chester Pk., OkehockingNatureCenter.org. Welkinweir. 162-acre estate is an architectural and landscaping masterpiece. Owned and maintained by the nonprofit Green Valleys Assn., it provides programs, environmental lectures, nature walks and environmental summer camps. Trails and walks connect hikers to Horse-Shoe Trail. Gardens are pleasant year-round. 1368 Prizer Rd. Welkinweir.org. Chanticleer. Enchanting seven-acre estate, the creation of the Rosengartens, who purchased the land in 1912. The 100 years of planting, cultivating and refining have made this an extraordinary garden. Lawn chairs at sites on the property suggest that you stop, stay a while and enjoy the view. April through Oct. 786 Church Rd. ChanticleerGarden.org. H. E. Myrick Conservation Center. A 300-acre landscape with vegetation and wildlife habitats. Part of the Brandywine Valley Assn., which has worked for over 50 years to protect the Brandywine Creek. Two marked self-guided nature trails—Hill and Stream Trail and Farm Path Trail. 1760 Unionville-Wawaset Rd. (Rt. 842). BrandywineWatershed.org. Nemours Mansion & Gardens. The late 18th-century French-style mansion was a gift from Alfred I. du Pont to his wife Alicia. Named after the French town of his great-great-grandfather, Nemours was thoroughly modern, incorporating the latest technology and many of Alfred’s inventions. 850 Alapocas Dr. NemoursMansion.org. The Mill at Anselma. On the Pickering Creek, the Mill is an extraordinary artifact of 250 years of Chester County’s industrial heritage, retaining its original Colonial-era power train, and multiple layers of industrial equipment. Demonstrations and hands-on activities. 1730 Conestoga Rd. AnselmaMill.org. Joanna Furnace. Hay Creek Valley Historical Assn. supports local heritage and provides a living experience of Berks County’s agricultural and technological past by demonstrating early American crafts and trades. The Hay Creek Festival, Sept. 8–10, features Early American crafts, antique toys, Civil War encampment, home crafts, children’s hands-on activities, food and olde tyme music. Rt. 10. HayCreek.org. Cliveden. Historic house museum on six landscaped acres. Site of the Battle of Germantown in 1777, which is reenacted the first Saturday in October. Includes original furnishing and decorative arts. 6401 Germantown Ave. Cliveden.org. Rock Ford Plantation. The 18th-C. Georgian-style home of Revolutionary War hero General Edward Hand. In Lancaster Co. Park, the estate includes the mansion, barn and Kauffman Museum of decorative arts. 881 Rockford Rd. RockFordPlantation.org. Pennsbury Manor. William Penn’s beautiful country plantation on the Delaware River, rebuilt to look as it did in 1700. Jacobean-style furnishings include 17th-century antiques. Mar 1–Dec 31. 400 Pennsbury Memorial Rd. PennsburyManor.org. Paoli Battlefield and Historic Waynesborough. Visit Paoli Battlefield where British troops routed General Wayne in 1777, or Waynesborough, a magnificent Georgian-style country manor house and home to General “Mad Anthony” Wayne, home to seven generations of the Wayne family. This year, Chester County honors the 240th Anniversary of the Campaign of 1777. PBPFInc.org; HistoricWaynesborough.org. Pennypacker Mills. A Colonial revival mansion, this was the home of PA Governor Samuel W. Pennypacker, preserved as a country gentleman’s estate. 5 Haldeman Rd. MontCoPA.org/HistoricSites. Hans Herr House. Oldest house in Lancaster County and oldest Mennonite Meeting House in America, built in 1719. Explore the main floor, the attic and cellar, plus a farm museum and Colonial garden. 1849 Hans Herr Dr. HansHerr.org. Delaware Center for the Contemporary Arts. A non-collecting contempoary art museum and gathering place for exploring new ideas in art, design, and technology. 200 S. Madison St. TheDCCA.org. Delaware Children’s Museum. The big yellow building along the Riverfront, focuses on science, math and technology and engages children in playful learning. 550 Justison St. DelawareChildrensMuseum.org. Marshall Steam Museum at Auburn Heights Preserve. See: “Day Trips & Outings. Boyertown Museum of Historic Vehicles. Featuring vehicles of all types: gasoline, electric and horse-drawn, including carriages, wagons and sleighs. You’ll see ‘high wheelers” and “safety bicycles,” vehicle builder’s tools, and local historic roadside architecture. 85 S. Walnut St. BoyertownMuseum.org. The Kennett Underground Railroad Center at the History Station. The Center takes visitors to a time when slavery existed and the Underground Railroad was a “trackless trail.” KennettUndergroundRR..org. DeMuth Museum. Describing itself as “National in scope, while reflecting the distinctive character of the Lancaster region,” the Demuth Museum, located in the artist’s former home, includes workrooms and gardens where artist Charles Demuth lived. American modernist painter Demuth traveled widely, but always came back to Lancaster. 120 E. King St. Demuth.org. Hands-On House Children’s Museum. Offering interactive activities for kids and families, through self-directed exhibits and programming that stimulate curiosity and invite the joy of discovery for everyone. 721 Landis Valley Rd. Call for dates and hours. HandsonHouse.org. National Christmas Center Family Attraction & Museum. Discover the memories, history and traditions of Christmas through life-sized indoor exhibits. Fifteen main galleries, numerous ever-changing smaller exhibits and a gift shop. 3427 Lincoln Hwy. (Rt. 30), NationalChristmasCenter.com. 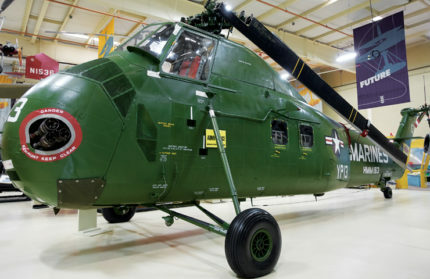 American Helicopter Museum & Education Center. For visitors of all ages, this museum brings the adventure and history of rotor-winged flight to life. 1220 American Blvd., Brandywine Airport. HelicopterMuseum.org. The Antique Ice Tool Museum. Follow the “ice man” from the harvest of the first major winter freeze to the storage, transportation, delivery and consumption of the product that shaped the way of life in this country from 1803-1940. Located in a restored 1834 stone barn. 1825 Sconnelltown Rd., AntiqueIceToolMuseum.org.